Oh, how we love our pets! But sometimes a dog or cat can wreak havoc on your home. Here, you'll find clever ways to handle challenging pet issues -- like pet hair everywhere, nose prints on windows, and paw prints on your floors. Homeowners with pets are sharing their favorite pet-friendly furniture, the best cleaning products for pet messes, steam cleaners and vacuum cleaners that work best on pet fur and pet messes -- even helpful moving tips for pet owners. Of all the different sponges I’ve used, the melamine foam sponge is the one I use most often in our house with 3 dogs. But I still get questions from curious readers about the safety of melamine foam — on skin, with kids, around pets, etc. Here’s what you need to know about melamine sponges and how they work. Want the easiest way to get sparkling, streak free windows? I’m constantly removing dog nose prints, cat paw prints, and my son’s hand prints from our glass sliding doors using this method. It’s the fastest way I can clean the windows without streaks or chemicals! I like to keep my plastic shopping bags rolled together, organized in self-dispensing bundles. It’s really easy to do. You just have to fold them together in a certain way. 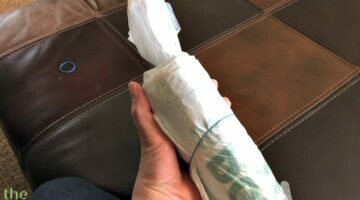 I’m going to show you how to roll plastic bags so you can easily pull out one bag at a time. Plus, fun ways to save time & money with your reusable shopping bags! DIY Porch Makeover: See How I Turned Our Small Front Porch Into A Cozy Outdoor Living Space With Breezy Porch Curtains! We have a small front porch, but it gets a good breeze and provides a nice place for the baby and dogs to play outside. Outdoor living spaces are important to me — so our front porch is the first place I decided to tackle with a makeover! See how I transformed our small boring porch into a cabana-like space — complete with porch curtains, a walk-through baby gate, wireless speaker, area rug, and much more. My Review Of The Sumo Bean Bag Chair: See Why I Love This Oversized Bean Bag Chair …And My Dog Does Too! Honestly, I wasn’t sure this Sumo bean bag chair would meet my needs as well as it has — but I’ve fallen in love with it! Here’s everything you need to know about this oversized bean bag chair before you buy one for yourself or as a gift. See the pros & cons and who I think will enjoy it the most. My husband calls me the sponge expert because I’ve tried practically every sponge under the sun. I definitely have my favorites (Sponge Mommy sponges and Magic Erasers). When the Eraser Daddy sponge hit the market, I couldn’t wait to try it! 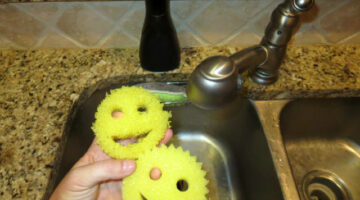 Here’s my review of this 2-sided sponge — it’s a Scrub Daddy sponge on 1 side and a melamine sponge on the other. I’ve always wondered if no-name melamine cleaning blocks are as good as Magic Erasers. So I tested them side by side. A cheap melamine sponge works great! Bona Spray Mop vs Shark Steam Mop – Which Is Best For Hardwood Floors? Want to keep your hardwood floors looking clean and brand new for years? !… Here are the tips I received from a hardwood floor expert, along with the hardwood floor mop I ultimately decided on… and why. Got a dog or a cat and a move in your future? 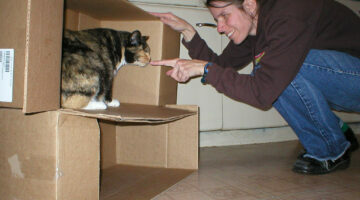 Here are some tips for helping pets transition through a move. With a little preparation ahead of time, your pet can be comfortable for your upcoming move. Magic Erasers Continue To Amaze Me – Even MORE Unique Uses That I’ve Tried! Want to see some more examples regarding the ‘magic’ of Mr. Clean Magic Erasers?… Here are a few more ways that I’ve used Magic Erasers in our home and how I continue to be amazed by these low-tech gadgets.